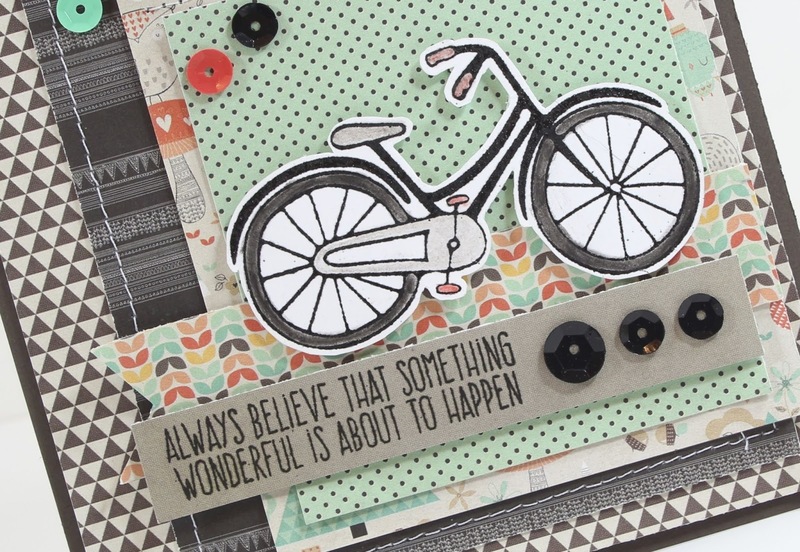 I there, it is Mary-Ann sharing my next card for January using It's a New Year - Creative Cafe KOTM. 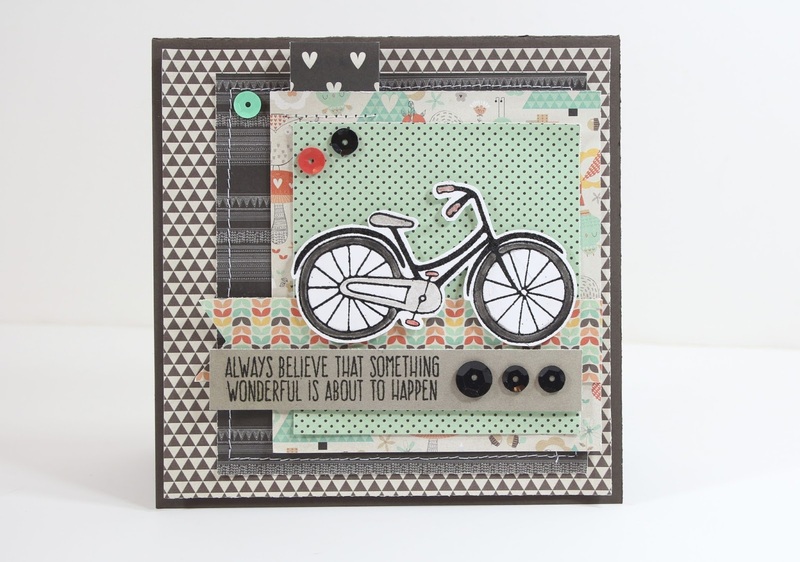 I adore this little bicycle and wanted to create an inspirational card. 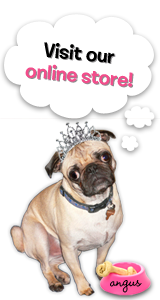 It is perfect for anyone, male or female for almost and uplifting situation. I started with a 5x5 card. 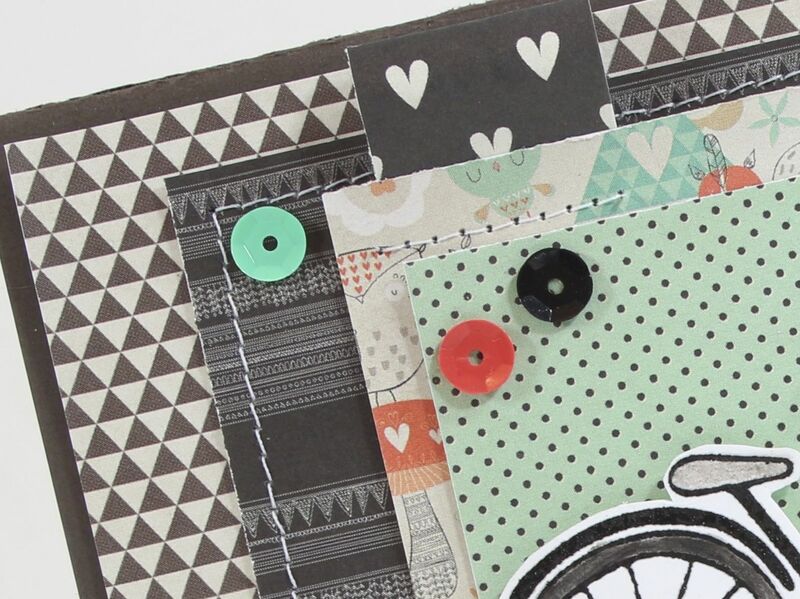 I took the dark gray cardstock included in your kit and cut it down to 10x5 and folded it in half. I placed a slightly smaller piece of triangle paper 4 3/4 x 4 3/4 on the card base using Scrap-Happy Glue. I then cut a piece of black patterned paper 4 x 4 1/4 and stitched the edges with my sewing machine. I continued to build off of this before adding to the front of the card. I cut a tan patterned piece, 3 1/2 x 4. Before adding this I tucked a piece of 1 x 3 heart paper, folded in half but not pressed flat behind the upper left of this paper. This just adds a bit of dimension. Then I added a 3 x 3 1/4 piece of teal polkadot. I added a little stitching to the top left to secure the heart paper. Cut a multi-colored paper 1 x 4 1/2 with a notch cut from the left and added as shown. Then I stamped my sentiment from the Add-on set "Believe" and trimmed it down to 3/4 x 4 piece of gray with Kool Tac Foam on top of that. Added the sequins as shown. Stamped, colored (with colored pencils) and fussy cut the bike and added it with Kool Tac foam for dimension. My card was complete. Here are a couple closeups. See you again real soon. Be sure to stop back by frequently to see inspiration throughout the month. Paper: The Rubber Cafe' - Creative Cafe KOTM - It's a New Year - Fancy Pants Design "True Friend"